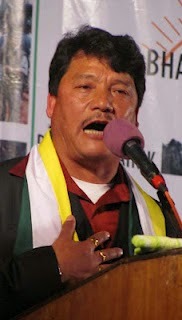 Bimal Gurung has sought a donation of Re 1 from every Gorkha speaking citizen of India to install statues of freedom fighter Durga Malla in Darjeeling, Kalimpong and Kurseong. A statue of Durga Malla, who was a Major in Subash Chandra Bose's Indian National Army, was unfurled on the premises of the Parliament on December 17, 2004, by then prime minister Manmohan Singh and Bharatiya Gorkha Parisangh, an apolitical organisation, had played a pivotal role. Today, Gurung said: "Despite a statue in Parliament, we do not have a single statue in the Darjeeling hills, which is considered the home of Indian Gorkhas. This is very unfortunate. I would appeal to all Gorkhas across India to donate at least Re 1 so that every one becomes part of the endeavour. Those wanting to donate more can also do so." Malla was born in Dehdradun on July 1, 1913, and joined INA in 1942. While on an espionage mission, he was captured by the British from Manipur on March 27, 1944, and hanged to death on August 25, 1944.